The start of the campaign, proper. We learn about Dr. Smith's specialties and habits. The party attends Dr. Smith's presentation at the Challenger Trust Banquet Lecture. Smith's London house burns down and he and his manservant go missing. In a London hotel a man is murdered three times. The party investigates the disappearances of Professor Smith by visiting his estate, the neighbouring town and grocer. They receive an urgent message summoning them to a secret meeting with Smith where they learn of the Sedefkar Simulacrum. They then begin preparations for their journey on the Simplon Orient Express. A terrible sight awaits them at the British Museum. Moretti instructs the ladies on proper auction etiquette and techniques. They practice bidding on cakes. Moretti meets with the deputy head of acquisitions at the British Museum to conduct further research. In the evening the party attends the auction at the House of Ausperg. There they meet several society types including Professor Julius Smith and his manservant. We also learn how much of a polyglot Professor Moretti truly is. During the auction there is a theft and a horrible murder! Taking the train from London, the investigators cross the channel to Calais and board the Orient Express rail coaches for Paris, and a research trip to the Bibliotheque National. Staying at the Moulin Noir, the ladies embark on an epic shopping foray and visit the Eiffel Tower and other iconic places of interest. Meanwhile Mrs. Sunderland and the Colonel are ably assisted in the Library by some hired help. They and the Professor make a series of discoveries regarding a corrupt noble, the Comte Fenalik, who resided at Poissy and was seized by the Kings Guard on the eve of the French Revolution and incarcerated in Charenton. Rumour of despicable activities in the cellars of the house are discovered. The Investigators excavate the entrance to the Comte de Fenalik's ruined cellars in the garden of the Doctor's house, and find many terrible things and horrific sights. After not too thorough an investigation a piece of the fabled Sedefkar Simulacrum is recovered and transported to Paris by train. Back at the Moulin Noir, recuperation and bathing follows and the travellers determine to embark on the Orient Express, after a traditional French poodle magic show and night at the opera to see the Italian diva Caterina Cavollaro. In the evening to Le Chat Noir for an auction for the scroll, however neither the Duc nor Mr Wellington appears, leaving the party in the tedious company of one Maximillian von Wurtheim – Grace is impressed. Worried the party head to investigate the shop, where they find the bodies of William Wellington partly flayed on the floor and Edgar dead of a drug overdose in his bed. Later during a trip to the Library, Grace stumbles upon a rare German text with extremely disturbing illustrations. She is struck by a sudden realisation that her friends are controlling her every move and whim and are not to be trusted. She heads to the hotel, gives Violet the slip and meets with Max von Wurtheim once more. Under his guidance she returns to the hotel to secure the funds they require to start the new life she craves together in the Exotic East, and a scuffle ensues with the cat-like Mrs. Sunderland. Grace flees once more empty handed and gives the Colonel and Violet the slip. Penniless, Grace goes to ground in a nearby hotel. Meanwhile the Professor and Mrs. Sunderland decide to attempt to recover the scroll alleged in the diary to be stored safely in Dream Lausanne, using the preparation recovered from Edgar's room. The party board the uncharacteristically late Orient Express once more, bound for Venice. On the train they encounter the recently bereaved and rather upset Maria Stagliani and her maid. Upon their arrival at Venice, Maria is set upon by an unpleasant fascist gentleman, and the party come to her aid. Staying at the Gritti Palace, the group enjoy a night in Venice and listen to the songs from the canals. In the morning, the Colonel tucks into a delicious plate of Parma kippers, before our heroes head to the hall of records in search of the mysterious Alvise Gremanci, who brought one of the pieces of the simulacrum to Venice. An afternoonâ€™s searching (whilst Violet stares longingly at the nearby shops) proves fruitless, and our heroes pay a visit to Maria, only to be refused entry by her loyal maid. A meeting with her paramour Georgio later in the day reveals her tale of woe, and we learn of the fiery passion that burns within the heart of young Italian men (and exactly what the Colonel thinks of such matters). An evening at the hotel is marred by a scream in the night and death on the canal. A missing railway buff, a toy train set and the lingering smell of smoke in a small bedsit. There's something rum going on and the investigators will follow it through to the end of the line. The party decide to head to the graveyard island in Venice, where they encounter an intermittently-accented gravedigger and uncover the headstone of Alvise Gremanci. Mrs. Sunderland takes solace from her grief in alcohol, aided by Dr. Winstanley (apparently sponsored by the Pimm's corporation). Led by clues from Alvise's gravestone, the group head to the famous Gremanci doll's house, where after some bartering with the aged Mr. Gremanci and a peculiar request from the Colonel, the party are invited to dinner by the slightly younger Sebastiano Gremanci. At the dinner party, our heroes learn more about the history of the sorcerous Alvise, but are too distracted with their own social scheming to pay much attention. Grace gets Dr. Winstanley drunk for her own nefarious purposes, whilst Mrs. Sunderland manages to get drunk all by herself (despite Violet's best efforts). An eventful dinner party leads to an eventful night, and there are some awkward silences over breakfast the following morning. Venice, 1925. Day dawns over the city of Venice and an awful stench pervades the air. After sampling the delights of Parma Kippers, the party attends the funeral of Maria Stagliani's father. During the ceremony, they hear scratching noises from within the bow-festooned coffin and many professional opinions are given as to the amount of air present in the heavy stone tomb in which the coffin is incarcerated. The party leaves the funeral by gondola but a fight breaks out with their treacherous gondolier and (following a botched roll) Violet falls in the stinking, greasy water of the Venetian canals. The party reaches the Gremanci Doll Works and the old storeroom packed with dolls. Mrs. Sunderland deftly unlocks the door to the accounts store and the Colonel and Violet search for clues. That evening, while the Colonel stays in his room, the rest of the party enjoy the luxurious surroundings of the hotel restaurant. While they are eating, the hotel lights go out and the party in the restaurant are assailed by mysterious events. Dr. Winstanley, in a fit of pique, argues with the restaurant staff and the Colonel demonstrates his prowess with a pistol. The remaining party members further discuss Mrs. Sunderland's recent alliances. Col. Goodenough is less than happy. 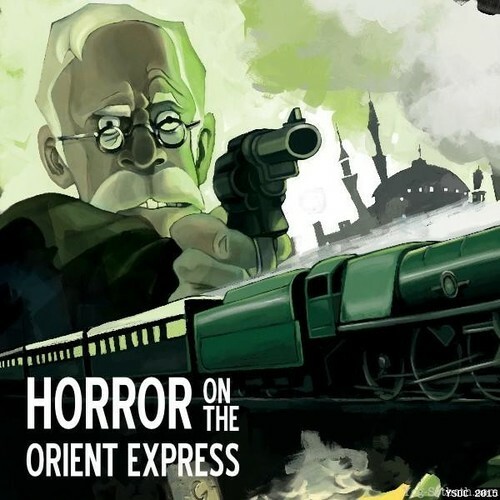 The Orient Express pulls in to Constantinople, and the group experiences grevious trouble at the station, further confirming the Colonel's opinion of foreigners. Two old friends await them in Constantinople – Amelia Scott, cousin of Violet's husband and (much to Col. Goodenough's displeasure) a modern woman, and Dr. Maximillian Calibré, fedora-wearing American archaeologist (whose resemblance to any person living or dead is entirely coincidental). We get to know our new party members as the group checks into the Moulin d'Orange Grand. With their missing property returned, the party is now in possession of the complete Sedefkar Simulacrum. Our heroes decide to drown their recent sorrows in copious amounts of alcohol, and old "hollow-legs" Calibré finds his fabled drinking skills desert him when he needs them most. Trieste, 1925. The party head for the spectacular caves of the Grotti di Postumia, and secure the services of a local tour guide. Descending into the dank bowels of the Earth, the investigators are attacked by their guide and his disreputable colleagues who seek the Colonelâ€™s new medallion for some dark arcane purpose. They in turn are attacked by a gang of fez wearing Turks and a large fire fight ensues, during which several party members are wounded, heroically. They flee under cover of darkness and the noise of combat. After some time they find a foreboding hidden chamber containing a large subterranean lake. Suddenly they are accosted by some immense telepathic power which instructs them to leave the medallion and go, so after some quick bartering Mrs. Sunderland throws the medallion into the heart of the lake, much to the upset of the Colonel. Searching the piles of occult paraphernalia and discarded offerings around the lake they eventually stumble upon a leg of the simulacrum and free it from its covering of flowstone. They flee on foot and are followed by the guides who are once again ambushed by Turks allowing the party to escape. Hurrying towards the town a 3rd fight breaks out leaving both sides heavily wounded while Mrs. Sunderland and party slip off into a waiting taxi and safety. Back in Trieste, they make rapid plans to depart on the Orient Express, pack and board the train. Yugoslavia, 1925. The party stay overnight in Oraszac. After breakfast, the Colonel receives a present and an awkward social situation from a new friend. After a discussion of dressings and dressing changes, the party is ready to go into the woods today, searching for the right arm of the Simulacrum. Deep in the woods the group find a strange hut, wherein the Colonel expresses a previously unmentioned interest in tapestries. Milos displays his pulling power when he finds the item that the party seek, but the partyâ€™s triumph rapidly turns to horror when the inhabitants of the hut display their true nature. Fleeing the scene, the Colonelâ€™s present only adds to our heroes troubles, and Violet is forced to face up to some unpleasantness. Further tragedy awaits them upon their return to Oraszac, and they seek sanctuary in the church of Father Filopovic. The players choose jelly baby homunculi in preparation for the final, dramatic episode of Horror on the Orient Express. Mrs. Sunderland and Mary visit a certain Mr. Shakti who helps them out with their... problems, whilst the Colonel and Amelia say goodbye to old friends. Max goes shopping. The party board a plane piloted by the dashing Max Von Richthofen, and renew an old (and unpleasant) acquaintance. Mrs. Sunderland makes good use of the on-board drinks cabinet. Surprised by a fowl attack at several thousand feet, the plane is forced to make an unusual manoeuvre, and the group soon find themselves once more upon the Orient Express. Peculiar goings-on and a surprise appearance lead to an audience with the Jigsaw Prince. Mrs. Sunderland dabbles in arcane mysteries and our heroes have a final confrontation with two powerful enemies. As the train and the drama hurtle towards their final, desperate conclusion, will the party be in time to save themselves and the world from the darkness and corruption of the terrible Sedefkar Simulacrum?